This post will be in two parts, a simple way to treat the two roles of the X-15. This first part focuses on the X-15 as the first space plane while the second will focus on the X-15 as the last research aircraft; the aircraft took on this latter designation in the wake Sputnik. This X-15’s relevance is not limited to the question of landings. The X-15 was one of the pre-space age programs that shaped the space race and played a significant part in moulding the current state of spaceflight. First proposed in 1954, the X-15 program’s primary goal was to gather data on the aerodynamics, structural integrity, response to heat build up, handling qualities, and control of an aircraft as it reenters the atmosphere from orbit. The program also intended to prove that a piloted space plane was a viable option for manned spaceflight. 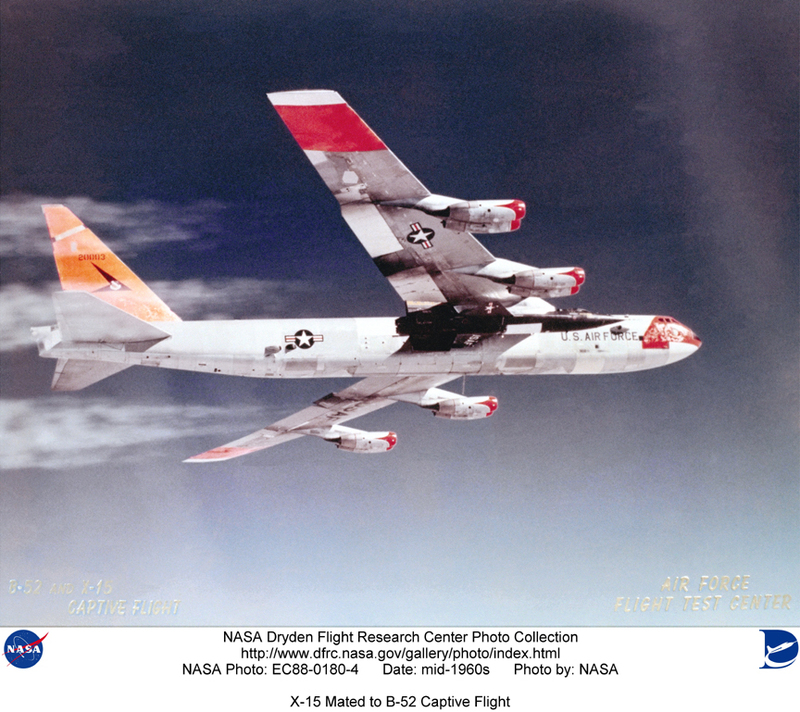 The program was a joint venture of the United States Air Force (USAF), the United States Navy (USN), and the NASA’s predecessor, the National Advisory Committee for Aeronautics (NACA). Each of these organizations stood to gain from the data gathered by the X-15 program. North American Aviation (NAA) as the external contractor built the actual aircraft. Development of the X-15 took four years. The first unpowered gliding flight took place on June 8, 1959 with the first powered flight less than three months after on September 17, 1959. NAA pilots were charged with fulfilling contractor demonstration requirements, testing the aircraft and carrying out the initial flights to make sure it was in perfect working order before NACA pilots would take over and push the aircraft to the limits of speed and altitude for aircraft. In the late 1950s, the X-15 was the latest in the US Air Force’s successful X-series whose inaugural the X-1 had previously broken the sound barrier. Living up to its predecessor, the X-15 broke existing altitude and speed records. It was the first aircraft to reach speed in excess of Mach 6.; it reached Mach 6.04 on November 6, 1961, finally peaking at Mach 6.7 on October 3, 1967. In terms of altitude, it set the record at 354,200 feet (or 67 miles) on August 22, 1963. 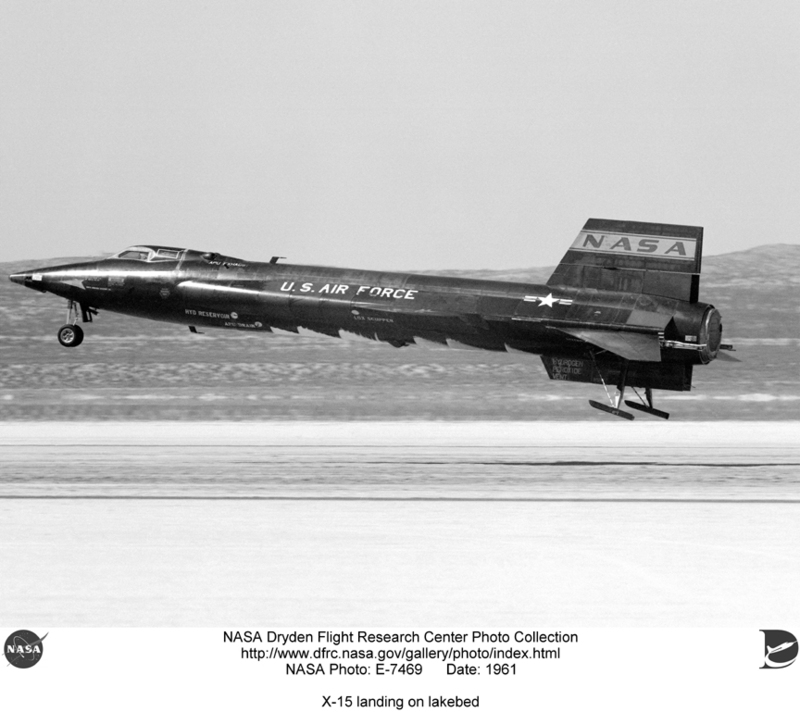 The X-15 was able to break previous records in large part due to its flight path – it flew in a parabolic arc (pictured below). 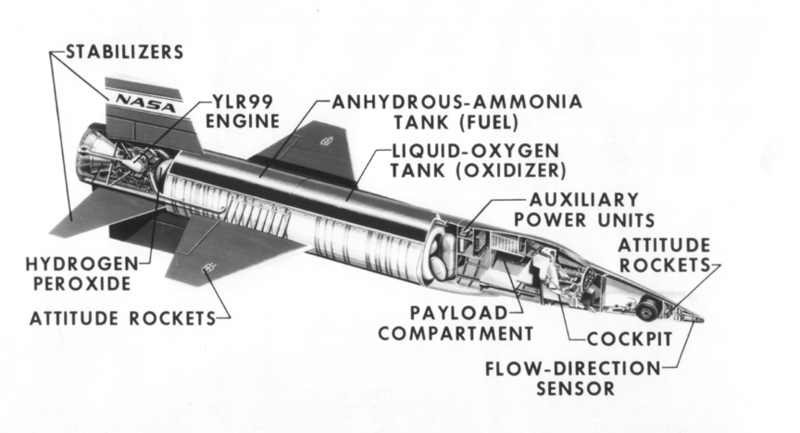 Once the X-15 was launched, the pilot would ignite the aircrafts’ rocket engines and begin a powered ascent towards the upper limits of the atmosphere. At a set altitude (which varied depending on the target height of the flight), the pilot shut down the main engine – the momentum gained during the powered flight was sufficient to carry the aircraft to its peak altitude. Once the aircraft no longer had enough energy to ascend, the pilot would experience a brief few minutes of weightlessness. 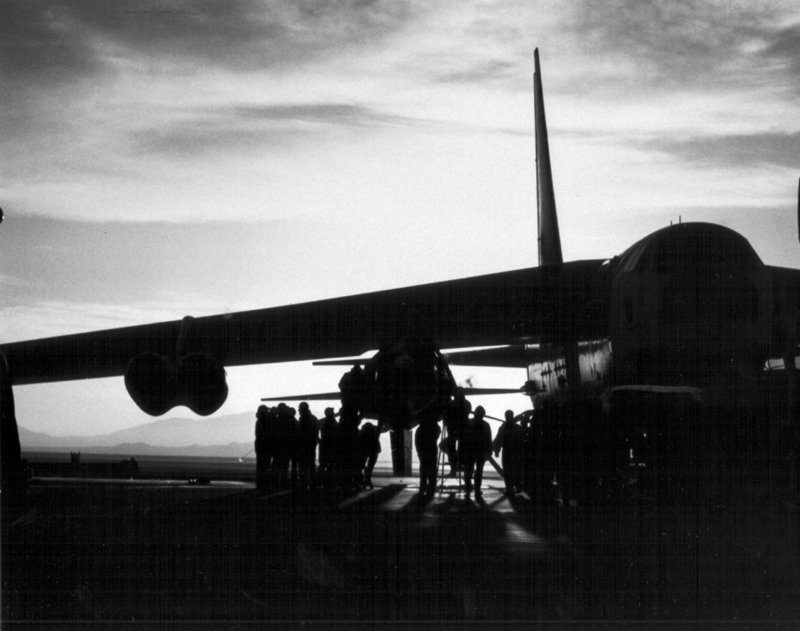 As gravity gradually won over the aircraft’s momentum, the X-15 began its return to earth. Because its descent stage was unpowered, it essentially fell from the upper atmosphere back to earth. But its inherent aerodynamic qualities allowed the pilot to have full control over the aircraft. Once it reached the thicker atmosphere, the X-15 became a glider. In the final stages of the descent, the pilot manoeuvred the aircraft to a safe, unpowered landing on the lakebed at Edwards Air Force Base. 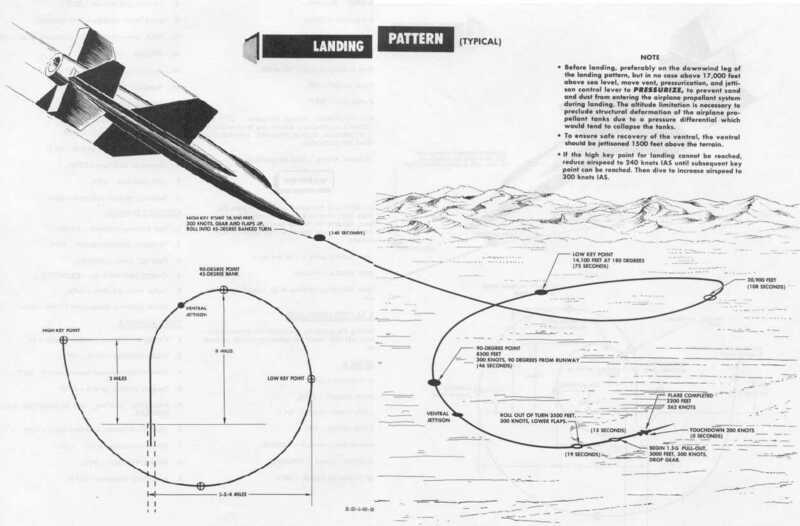 One of the most important aspects of the flight in light of the unpowered descent was the initial angle of ascent; the ballistic trajectory meant that the X-15 would fall at the same angle it previously climbed. 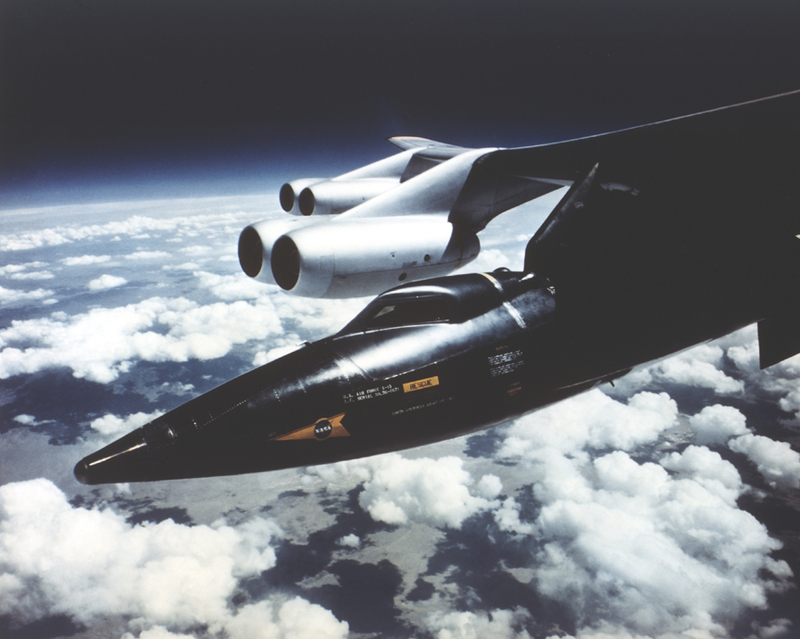 If the ascent was too steep, the X-15 would burn up from the heat of reentry. 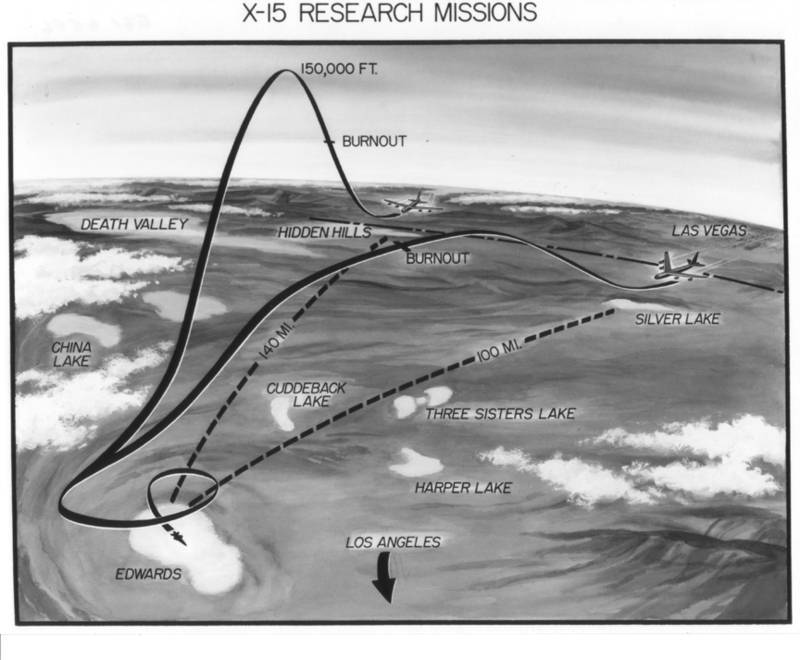 This flight path of the X-15 that enabled it to break speed and altitude records also put it in a unique situation. The X-15 wasn’t just a jet aircraft. It also had to fly in the upper atmospheric portion of the flight (its peak altitude of 67 miles is well above the commonly accepted 50 mile threshold of space) and glide to a landing. Piloting the X-15 therefore necessitated three distinct methods of flying associated with each of the three stages of the flight: the powered ascent, the weightless period (lasting a matter of minutes), and the unpowered gliding descent and landing. The X-15 was part jet aircraft, part glider, and part spaceship. It was esoteric to say the least. The fly the aircraft, the pilot had three control sticks inside the cockpit – one centre stick, one on his right, and one on his left. During the high altitude portion of the flight, the atmosphere wasn’t thick enough for traditional ailerons, elevators, and rudders to effect any change to the aircrafts movements. To give the pilot control during this middle phase, the X-15 used a second set of controls inside the nose of the aircraft. The left-hand stick controlled eight small hydrogen peroxide rockets, also called the ballistic controls or thrusters. These allowed the pilot to manipulate the aircraft on the pitch and yaw axes. This was a fairly limited amount of control; by firing the thrusters individually or in combination, the pilot could gently nudge the aircraft and ensure that he stayed upright at the top of the flight and had the aircraft’s nose properly aligned towards the thickening atmosphere going into the descent stage. The pilot began the descent stage with the ballistic controls, switching back to his traditional controls once the atmosphere became sufficiently thick. Although the ailerons, elevators, and rudders could be used to control the aircraft during this stage, it was a very different mode of flying compared to the earlier powered ascent through the atmosphere. The pilot was controlling his fall rather than flying the aircraft to a landing. Without engines, he had no means to climb to a higher altitude. He had one chance to bring the aircraft down to a landing. The dual-environmental nature of the X-15’s flight coupled with the necessary dual-role of the pilot made the aircraft a unique one that pushed the envelope of human control in flight. The pilots who flew the X-15, both those from NAA and those from the NACA who really pushed the limits of the aircraft’s performance, met a new challenge. They had to learn a new way to fly in the upper limits of the atmosphere and marry this new knowledge with their prior traditional training. They had to switch seamlessly between traditional and ballistic controls to ensure a smooth flight from launch to landing. Although the size of X-15 meant that it could only fly as high and long as its fuel stores would last, the project proved that the concept of a space plane was well within the realm of possibility. 1. “X-15 Flight Program Concluded”. Press Release. Washington: NASA. 1968. 3. Godwin, R. X-15: the NASA mission reports, incorporating files from the USAF: Collector’s Guide Publishing. 2000. 4. Mindell, David A. Digital Apollo. Cambridge: MIT Press. 2008. 5. Thompson, Milton O. At the edge of space: the X-15 flight program: Smithsonian Inst Pr. 1992. 6. Thompson, Milton O. Flying Without Wings: NASA lifting bodies and the birth of the space shuttle. Washington: Smithsonian Institution Press. 1999. 8. “X-Planes”. http://www.centennialofflight.gov/essay/Evolution_of_Technology/early_X_planes/Tech27.htm. [Accessed August 13, 2010]. I’ve always liked the idea of space planes, and have had something of an interest in the X-15s, but never knew much more than what I’d seen on various TV shows. I think this easily surpasses those in regards to really describing what it was that a pilot and the plane had to face. You also have a beautiful writing style which is easy to follow and a joy to read; I look forward to reading more of your work!